Kit for characterization of climatic and thermostatic chambers (FD X 15-140). We provide a kit for characterization and verification of your environmental temperature chambers. The kit complies to the FD X15-140 standard. Depending on the size of the chamber, a 9 points or 15 points verification may be proposed. 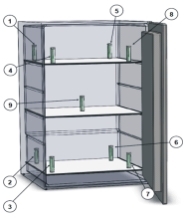 This system allows you to characterize and qualify your enclosures such as climatic chambers, refrigerators, freezers. Note that the lab and pharmacy often recommends applying this qualification once a year. We rent you the characterization kit for one week (or more). With our assistance service you install the system in the chamber to characterize (or we can od it for you). The data from the various temperature sensors are automatically transmitted via GPRS (mobile phone network) to Newsteo server. Newsteo remotely edits the characterization report. Once you return the rented equipment, your report will be sent to you and invoiced. 9 wireless temperature probes to be placed in the enclosure (for a volume chamber less than or equal to 2 m3) or 15 wireless temperature probes for a volume chamber between 2 m3 and 20 m3. The temperature sensors have an accuracy of ± 0.1 ° C.
Temperature sensors calibration certificates. These certifications are renewed once a year. 1 Col11 GPRS Collector, with its power supply. The Installation and User Guides. You can install the kit yourself our we can come at your company to do the measurement for you.